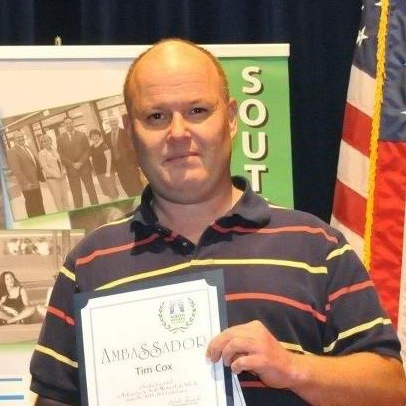 Tim Cox is a graduate of Southwest Licking Local Schools and started working as a School Bus Driver in 1984. He became Transportation Director of Groveport Madison School for Laidlaw Transit in 1997. In 2001 he worked for Reynoldsburg Local School transportation Department as transportation director. In 2007 He joined the sixth largest School system in Ohio as South-Western City School Transportation Director. The district covers 119 square miles with an enrollment of approximately 20,000 students. The district has a 3 tier system and has 156 full time bus drivers, 35 bus aides, 8 mechanics, 4 clerks, 2 routing specialists and an assistant supervisor. Mr. Cox has been a member of Ohio Association for Pupil Transportation since 1997 and has served as central regional director, vice president, president-elect, president and is currently serves as past president. In addition, he is a member of the National Association for Pupil Transportation, and the Ohio Association of School Business Officials. Mr. Cox has also served as an assistant marching band director for Pickerington Local Schools since 1993. He is proud to have marched with the band at the Macy’s, Rose Bowl, Orange Bowl, Fiesta Bowl, and Philadelphia Thanksgiving Day Parades. Mr. Cox has two children, Rachel, a sophomore at Watkins Memorial High School, and Danny, an eighth grader at Watkins Middle School.